If you already have the Original Pokeno and would like to play with more than 12 people, then order the Pokeno 2. Jumbo 7" x 9-1/2" game boards make play easier and like Bingo, players cover the cards on their boards to finish lines, four corners or cover all. 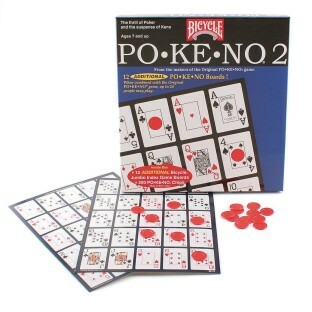 Includes 12 Pokeno 2 Boards with 200 Pokeno cover chips. The board design is different than Original Pokeno to allow more people to play. Pokeno is a spin off bingo. It gives the residents another way to use their brains. It takes some getting used to at the beginning of the game for some but most of our residents get the hang of it after a few rounds and some help from staff. Remember a few will always need a little assistance but let them try first then point to the card allow them to put the bingo chip on the card if they are able. I have always enjoyed this game but had not played in some time. The card has too much on it for many of our memory care residents.